All of the Braille Institute's multisensory books, which are part of their free Special Collection Program, were developed in consultation with their Child Development professionals and evaluated in the field by parents, teachers and librarians who work with blind preschoolers. These popular stories are especially adapted to help blind children build concepts and provide a fun-filled way to introduce them to the wonderful world of reading. These multisensory storybook kits, designed specifically for visually impaired preschoolers, help parents introduce their children to basic braille construction. Each popular picture book features uncontracted braille overlays, along with a descriptive audiotape and plastic toys that represent characters or objects in the story. As a child grows, they will enjoy this next step in our series of multisensory storybook kits designed for visually impaired early school-aged children and their parents. These custom-designed print and braille books also include descriptive audio and one, single manipulative character or object from the story. 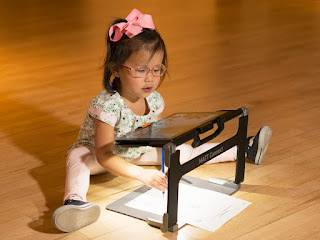 Line drawings representing the object are created shape-by-shape to help the blind child learn how drawings represent three-dimensional objects.